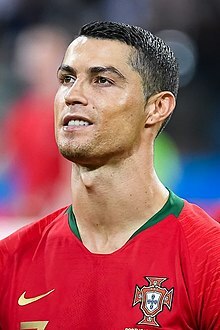 کریستیانو رونالدو (اینگیلیسجه: Cristiano Ronaldo) (دوْغوم:۵ فوریه ۱۹۸۵(1985-02-05) ‏(۳۴ یاش) Funchal) بیر فوتبالیست. یوونتوس فوتبال کولوبو و پورتوقال میلّی تیمی ترکیبینده چیخیش ائدیب و هوجومچو موقعیتینده اوْیناییب. یورو ۲۰۱۶ و فیفا دونیا کاپی ۲۰۱۴ و فیفا دونیا کاپی ۲۰۱۸ و فیفا دونیا کاپی ۲۰۱۰ اوْیونلاریندا مئیدانا گئدیب. ↑ All appearance(s) in اوروپا قهرمانلار لیگی, unless where noted. ↑ Does not include one goal scored on 18 September 2010 against رئال سوسیداد. Marca, which awards the Pichichi Trophy, attribute it to Ronaldo, while La Liga and UEFA attribute it to Pepe. ↑ FIFA Club World Cup UAE 2017: List of players: Real Madrid CF (PDF). FIFA (16 December 2017). ↑ 2018 FIFA World Cup Russia – List of Players (PDF). Fédération Internationale de Football Association (10 June 2018). ↑ ۴٫۰ ۴٫۱ Cristiano Ronaldo. footballzz.co.uk. یوْخلانیلیب23 May 2016. ↑ Cristiano Ronaldo. StretfordEnd.co.uk. یوْخلانیلیب28 December 2013. ↑ Cristiano Ronaldo: Cristiano Ronaldo Dos Santos Aveiro: 2009–10. BDFutbol. یوْخلانیلیب25 December 2013. ↑ Cristiano Ronaldo: Cristiano Ronaldo Dos Santos Aveiro: 2010–11. BDFutbol. یوْخلانیلیب25 December 2013. ↑ "Pepe's goal is awarded to Cristiano Ronaldo". Marca (in Spanish) (Spain). 18 September 2010. Archived from the original on 12 November 2010. Retrieved 4 December 2010. ↑ Cristiano Ronaldo: Cristiano Ronaldo Dos Santos Aveiro: 2011–12. BDFutbol. یوْخلانیلیب25 December 2013. ↑ Cristiano Ronaldo: Cristiano Ronaldo Dos Santos Aveiro: 2012–13. BDFutbol. یوْخلانیلیب25 December 2013. ↑ Cristiano Ronaldo: Cristiano Ronaldo Dos Santos Aveiro: 2013–14. BDFutbol. یوْخلانیلیب27 August 2014. ↑ ۱۲٫۰ ۱۲٫۱ ۱۲٫۲ ۱۲٫۳ ۱۲٫۴ Cristiano Ronaldo. Soccerway. Perform Group. یوْخلانیلیب8 April 2017. قارداش پروژه‌لرده کریستیانو رونالدو گؤره داها آرتیق بیلگی‌لر تاپابیلرسینیز.